Item is one (1) edition of "Canadian House & Home" Magazine, Feb 2010. It includes a feature article of a renovated Port Hope home (68 Cavan Street) completed by Alan de la Vigne, p. 54. "Old Ontario Houses Traditions in Local Architecture"
File consists of newspaper articles related to the Anglican School for Girls. It also includes: Program for dedication of St. Luke's Chapel; and Program for the dedication of the swimming pool. Contains mostly the Quinte Branch newsletter but also a number of walking tours of Belleville and Picton. Some of the minutes from meetings are also included as are some newspaper clippings associated with historic buildings of the region. 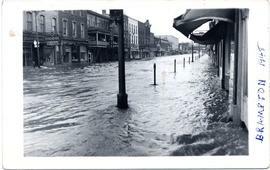 Item consists of a photographic postcard of the 1948 Brampton flood. 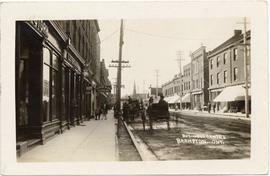 Item consists of a real photo postcard of Main Street North, Brampton, looking north. File consists of correspondence related to the "CNR Construction Project" for the renovation of the Canadian Northern Railway station building located on Hope Street, Port Hope.